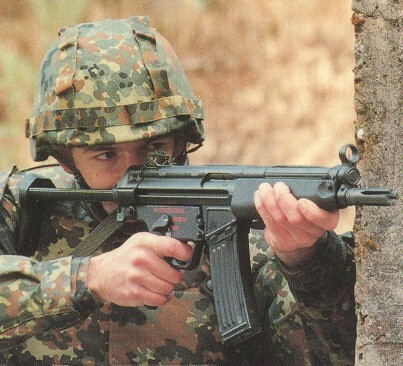 HK53A3 with old Hensoldt Aiming Point Projector, a bulky C cell sighting system that is totally obsolete now. Several examples are available in the U.S., usually commanding high prices for collectors. 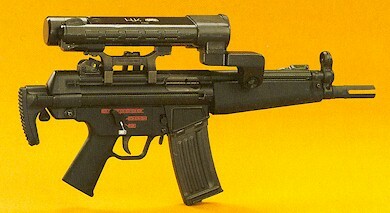 HK53 firing port weapon for use on tanks and armored personnel carriers. 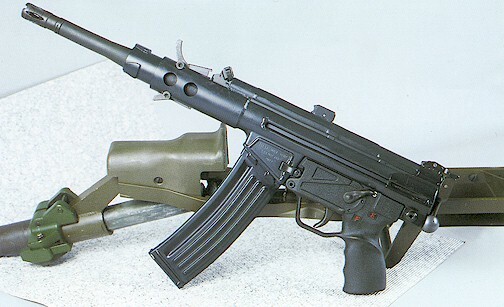 It is called the HK53 MICV. Very rare variant! HK Law Enforcement brochure photo from mid-1990s (predating the current full color catalogs) that shows the frangible ammunition adapter on the HK53A3. It allows very lightweight frangible bullets to be fired from the HK53 with sufficient recoil impulse to cycle the gun in all modes of fire. It is one of only a few photos of the adapter in HK sales literature. 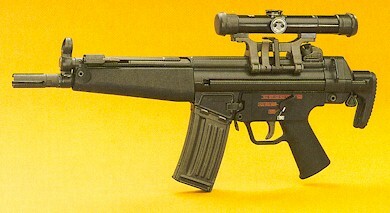 Heckler & Koch promotional photo with HK53A3, 30 round steel magazine, three round burst trigger group. 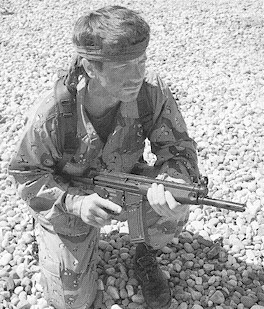 This is undoubtedly an HK employee, name unknown, wearing standard issue German camouflage. 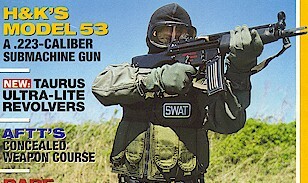 Cover of recent issue of SWAT magazine featuring HK53. Pose is completely incorrect technique. Bladed stance, center of gravity not forward, feet at 45 degree angle. This is more like a traditional rifle shooting stance.